Schack Art Center celebrates and promotes the arts for the enhancement of community life. In 1974 artists and art advocates formed the Arts Council of Snohomish County, a non-profit organization dedicated to celebrating and promoting the arts for the enhancement of community life. Originally presenting a broad assortment of arts programming, in 1981 the organization turned its primary focus to visual arts through youth education programs, artist support services, and admission free gallery shows featuring local artists. By the late 1990's it was clear the Arts Council needed to secure a permanent home that would meet current programming needs and allow for sustainable growth. 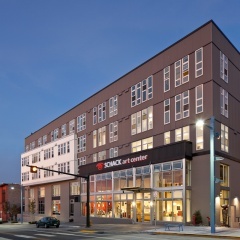 After many years of thoughtful planning, a $6 million capital campaign was launched in 2006 to build a multi-use regional arts center in partnership with Artspace Projects, Inc. On April 30, 2011 the Council's new home, the Schack Art Center, opened to the public with great celebration. 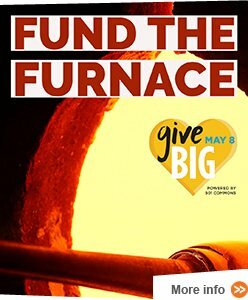 Named after John and Idamae Schack, the Schack Art Center, celebrates their steadfast support of Everett's cultural institutions and commitment to art and artists as the heart of every vibrant community. 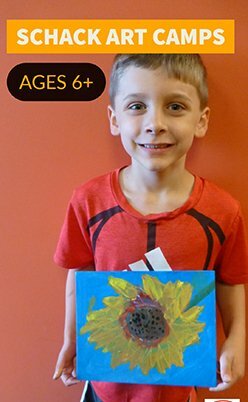 Today the Schack Art Center invites artists at all levels - from beginning to master, as well as art lovers of all ages to engage in the creative process. This admission-free facility is the place to view diverse artwork from locally and internationally known professional artists, as well as emerging young talents; learn about art through a wide variety of community art classes and K-16 art education programs; and create art in production studios for printmaking, lapidary, metalsmithing, painting, glassblowing, kilnforming, and flameworking. Schack Art Center has provided space for the expansion of existing programs, as well as new opportunities to continue our commitment to promoting and celebrating the visual arts. In 2014 the Schack Art Center received the Governor's Award for Outstanding Arts Organization in the State of Washington. Please click here to download a timeline of major moments in Schack History.